I wasn't sure what reading I would get done last week. It was the final push of the school year. The final week for instruction. The final assignments to be graded. The final field trip. It was insane. And yet, I did read. As the week grew busier and busier, it was almost as if I needed to read to stay sane. So much was crazy around me, I needed those moments of quiet. I stole them every chance I got. And now, two days of school left. Time for goodbyes, final thoughts, and a crazy fun field day on Tuesday. My report cards are written, my comments have been typed. The real work of the week is done so I can just sit back and enjoy it. There were a ton of great books. A quick note, Round Ireland is a memoir for adults, not kids. We're taking a family trip to Ireland this summer and it was fun to read and imagine. The Spinny Icky Showdown is an upcoming book in the Arnie and the Doughnut series. So much fun. Both it and Apocalypse Bow-Wow would be good for third grade on up. A Handful of Stars is by Cynthia Lord. She is simply brilliant and I cannot wait to share this one with my dog loving students from this year and the past. Both it and the 7th volume in the Cemetery Road series, The Lock Ness Punster, would be great for fourth grade on up. Simon vs. the Homo Sapiens Agenda is a amazing YA book. I absolutely loved and devoured it. I listened to the audio, purchased it on Kindle so I could read faster. Finished it, cried, and listened to the last quarter again as I ran errands because I didn't want to be done. I love Simon. Finally, Billy's Booger blew me away. By William Joyce, this is a "sorta" memoir (his words) about the first book he wrote when he was in fourth grade. The start and end of the book follow Joyce in his fourth grade classroom. In the center of the book is his fourth grade masterpiece, inserted in the book. I absolutely loved this and would easily use it in third on up. 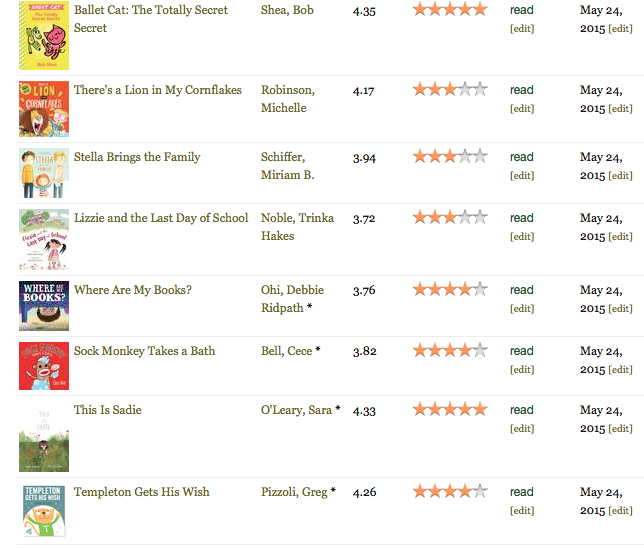 Wednesday will find me joining Donalyn Miller and other friends as I participate in Summer #bookaday once again. By my calculations, my summer will be seventy-five days. That means I need to read seventy-five books. Before you faint, any book counts. I could read seventy-five picture books, and I might. 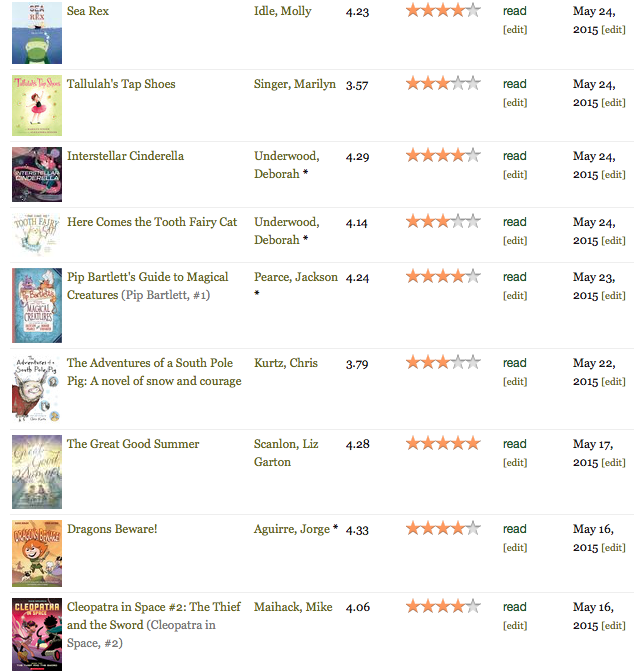 I usually end up doubling my goal because I do read so many picture books and graphic novels. We will see. 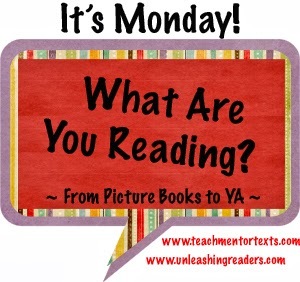 Join in if you can, and follow the hashtag #bookaday on Twitter. You'll find so many recommendations, you will just have to carve out your own time and read with us. Tuesday will wrap-up my fifteenth year teaching in Monticello. Saying good-bye never gets easier. Never. Each year I look at that beautiful sea of faces staring up at me – most excited to begin their summer, some a bit apprehensive about leaving what is known – and I get choked up. Five years ago that sea of faces expanded. No longer was I self-contained and sharing my year with 25 or so students, but my circle expanded to three of the five fifth grade classrooms and 75+ children each year. Friday was our last day switching for subjects for the year. Monday will see my students helping to close up our room, pack away their supplies, and a chance to learn from a speaker. Tuesday we will have our “field day” will all sorts of events for the kids to play on. So Friday was it. I began the class the way I always do on our last day, reflecting on our reading for the year, taking photos with each child sharing how many books they read during our time together. The room was filled with laughter and chatter. Kids shared titles, exclaimed over how much they had read. We had a long discussion before beginning regarding these “numbers” – how there was no competition. 12 books were celebrated as much as 200. The students were fascinated on the total amount the entire classroom read and cannot wait to find out how much our three rooms read once my class does this activity on Monday. And with the last photo taken, it was time to read. I read aloud every single day to my students. Often it is a picture book. Occasionally it is a chapter book. With our condensed class time, those books are often saved for the homerooms. Sometimes it is an article or the back of the book for a book talk. Today would be our last read aloud time together. The students moved into the position they knew well after our time together. Circled up at the carpet, they smiled. I told them it would be a new book; I have never read it to a classroom before. When I shared the title, author, and illustrator, murmurs of recognition flooded the room. They knew this pair’s work with previous picture books we have shared. And then, I read. I’ve totally got this. In control, no problem. I wonder if they understood that metaphor? Love this one, so powerful. Oh no, sadness creeping into my heart, no. Still will see them before Tuesday. I’ve got this. And then, all too soon, I reached the last two pages. The impact of the book and the finality of this time hit me like a ton of bricks. I knew the cry was coming. A sob escaped my lips before I could stop it. I looked up at their faces and saw watery eyes staring back. I finished and put the book on my lap. Deep breath. I stood and started to talk. I tried to tell them how much it meant to be their teacher. How I will love them forever and will always be here if they need me. Why I fought so hard to make reading and writing a part of their life. I don’t know if they heard me. Tears were streaming and I couldn’t hold them back. Teaching is so powerful; sometimes we forget the impact we can make. In the day-to-day part of our job, we are juggling so many balls; we’re just trying to keep them from falling. Friday morning I got that awesome reminder that what we do matters. It really does. There is nowhere I would rather be. For the record, I made it through the second class with minimal tears. I was prepared. I make no promises on reading this book to my homeroom on our last day. I think I should probably stock up on the tissues now. And, should you want to have your own emotional meltdown, go check out the book that caused the ugly cry. You will be glad you did. I'm catching up a bit here. 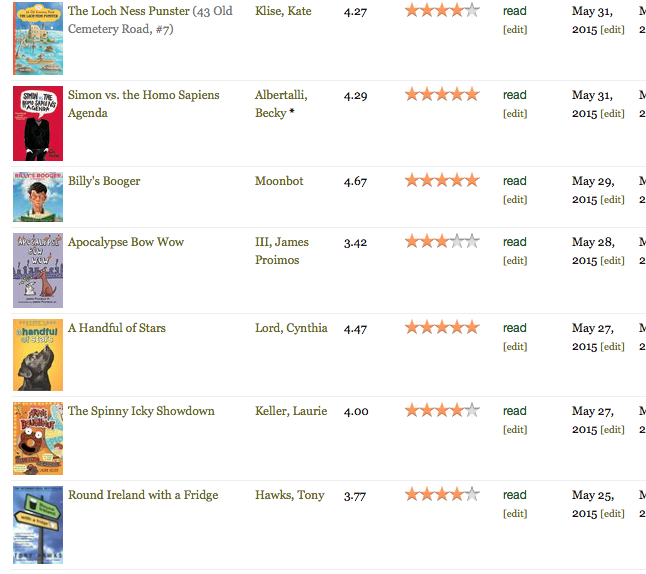 Due to a blog tour last week, I didn't get to post the books I was reading for the previous week. Below you will find what I've read over the last two weeks. Unfortunately, I don't have the time to review every single one. I consider myself extremely blessed to live in a time with the crazy amount of amazing books we have around. I will say that: Unusual Chickens for the Exceptional Poultry Farmer, Jack: The True Story of Jack and the Beanstalk, Cleopatra in Space #2, and Dragons Beware have already found many readers in my classroom. I'm currently reading Round Ireland With A Fridge by Tony Hawks. Not for kids, but an entertaining memoir about a guy who hitchhiked around Ireland with a dorm fridge as a result of a bet. It's hilarious. 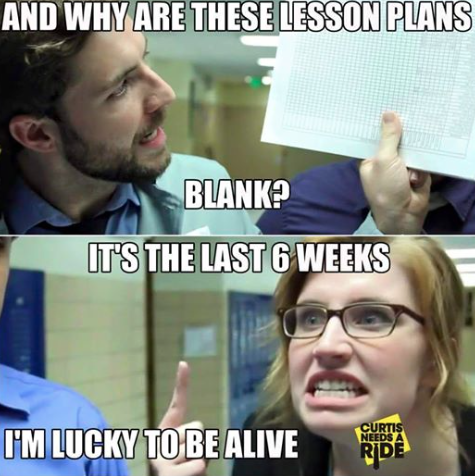 I am rapidly approaching the end of my fifteenth year of teaching in my district, the seventeenth year of teaching in public schools, and the nineteenth year of teaching in any school. In these past nineteen years I have learned something; the school year is a marathon, not a sprint. When May hits, it sometimes feels like that last few miles are up the steepest hill in the country. The month of May always makes me realize that the summer “off” is truly needed to regain your sanity, catch up on sleep, and get your life back in order. My email inboxes are way past my normal comfort level of emails that are waiting for me. My house is a mess. My “to read” stack is growing by the day. The end of the year is upon us and I cannot keep up. This time of year also fills me with a bit of despair. I worry that I haven’t done enough, taught enough, connected enough. I can only assume it is a bit like the feeling when your children go off to college, you wonder if they are ready. I look at the beautiful faces of my students and think of everything I haven’t done, haven’t gotten to, haven’t… I don’t take time to step back and appreciate what we have accomplished. That’s why Tuesday was a gift. A friend who teaches up north asked if she could visit my classroom for a day and observe. Of course I said yes. When she was in my first ELA class, I asked my students to introduce themselves to her and share a title they’ve read this year and loved. My heart filled to the brim with their answers, so I had the second and third classes do the same thing. The One and Only Ivan (mentioned too often to count) because it is beautiful. See You at Harry’s because of the emotions it makes you feel. The Maze Runner because it caught me with the non-stop action and twists. Out of the Dust because of the way there weren’t many words, but there were the right ones. Mark of the Dragonfly because of the beautiful characters. All of the Answers because it was the first book I loved. No one hesitated and couldn’t think of a book. Many groaned that I would only select one. Most students knew the title and author without having to reference anything. These were books that lived in their hearts. When someone would mention a title, there would be whispers of agreement. In each class I saw a student sneak out their reading notebook to record some titles on their “to read” list. Each student spoke of a connection they had made that was beyond anything I can teach. It is personal and belongs to them. Listening to my beautiful students I realized something. I might not have checked off every single thing I wanted to this year in regard to lessons, but I did teach the most important one, and I taught it all year long. My students have connected to books and authors. They have each found their own path and level of connection, but it is greater than when I met them in August. That is important to me. As my friend was preparing to leave yesterday she paid me the highest compliment she could have, although she probably didn’t know it. As we hugged goodbye with students sprawled out around the room reading, she said she enjoyed being in my room. That the feeling was relaxed and you could see the relationship I had with each student. With that, she gave me a gift. That is all I can truly hope for in my year with my students. That they know they are loved and know that I want them in my room. So while May will continue to be crazy as I run uphill these last nine days, my load is lighter. A visitor to my classroom made me reflect on what I have truly taught this year and now I know, my year is complete. I don't remember a time in my life when I didn't know about the story of Dorothy, Toto, and their journey home. It wasn't, however, through a book that I knew this story, but a movie. I think many people my age grew up watching The Wizard of Oz. I clearly remember being fascinated by Dorothy's shoes, the colors of the movie, and the witch's evil monkeys. There were scenes in that movie that were just breathtakingly beautiful. It is for this reason that I was so intrigued when Cider Mill Press shared this newly illustrated copy of The Wizard of Oz with me. This edition is huge! I took a photo next to my dog, Rosie, for reference. I loved the size. I can just imagine some of my students pouring over the illustrations, really studying them. Most of the story will be similar to the one they remember from the movie, but there are a few differences. I think it would be a fascinating discussion with some of my movie buffs in class to discuss the way the two differ. Several illustrations stood out to me, but two favorites would include the lion asleep in the field of poppies and one where Dorothy's group first reaches the Emerald City. They have to wear protective eye glasses because the brightness of the city will hurt their eyes. I know my students will immediately comment on the fact that their glasses give the group an almost Steampunk look. I look forward to bringing this book into my classroom on Monday. I have a feeling that many of my Wizard of Oz fans will be clamoring to read it. I read Ruth's post this morning (HERE) and paused. I loved it, I really did. I had a conversation about failure with a friend recently. I don't consider failure a negative, I really don't. My failures are what I learn the most from. While sometimes they can feel like set backs, I think they are critical for growth. And this year has been full of them. Looking at Ruth's post, I thought of my own writing life. It has been a mess. Last year about this time I was pretty set on writing a book for teachers. I was blogging regularly. I had absolutely written more for Choice Literacy than I have this year. So what happened? I still love writing, but I have learned that I tend to go all in on one area of my life, and it leaves me lacking in other areas. If I am tweeting a lot and keeping up with my PLN, I'm neglecting reading. If I'm reading a lot, I'm not writing. And so on. So this school year I have worked a lot on balance. It began in August. After writing about 15,000 words towards a professional book, I felt like I had lost my footing. I wasn't sure what direction I was taking, but I didn't like it. Then a friend's health made me reevaluate. When I was writing, I was writing a lot. I wasn't present in my life. I began to pull back. When I paused, a new mindset fell into place. A book might come one day, but not today. This blog will be posted to on a less regular basis. I tweet less. I have written fewer articles. I've read a lot, but not as much as before. And yet, I have gained so much. I've been with my boys more. I've began to exercise regularly. I work to spend more time with people around me. To really enjoy the life I am living. I've lost some important people this year, and so have many in my community. The saying at the top of this post is one I now cherish. 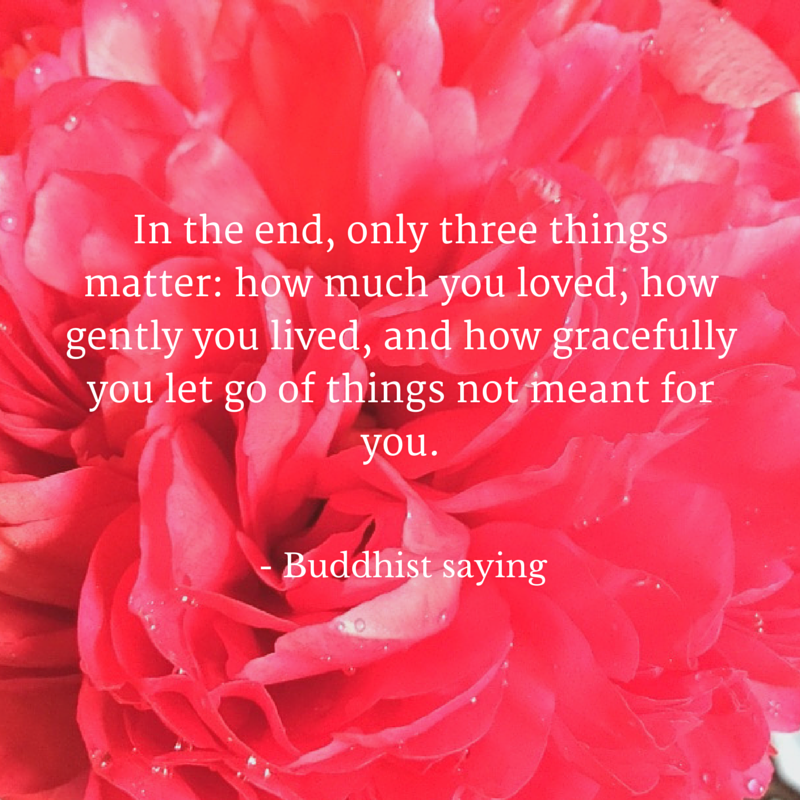 Some attribute it to Buddha, some say it is a Buddhist saying, but I really don't care where it came from. It is what I am trying so hard to live. I doubt I will care if I wrote that book when I reach the end. I'm sure the number of books that I read won't cross my mind. But those I love will. The way I lived my life will matter. And that is what I will place at the center. Everything else can fall in around that. As I finish this school year I realize that I'm not where I thought I would be at this time last year. Technically, I failed, and yet I have learned more about myself than I ever thought I could. What a gift it has been. You can tell it is the end of the school year. I managed to read one book last week. Fortunately it was amazing. A Whole New Ballgame by Phil Bildner doesn't come out until next fall. This is super unfortunate because when I book talked it to my three reading classes last Friday, I have a waiting list seven deep (at least) in every single class. 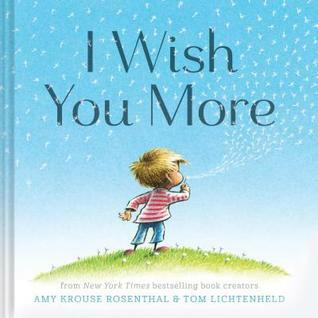 This book follows the story of Rip and Red as they begin fifth grade together. Red is on the autism spectrum and Rip, his best friend, knows how to calm him down when needed. Boy is it needed at the start of their school year. Many curve balls are thrown their way. They have a new teacher, Mr. Acevedo instead of Mrs. Hamburger like was planned. Mr. Acevedo has earrings, tattoos, believes in something called reading and writing workshop, and is just a bit goofy. I love him. There is so much to love about this book. Look for it next August. The Dynamic Duo. 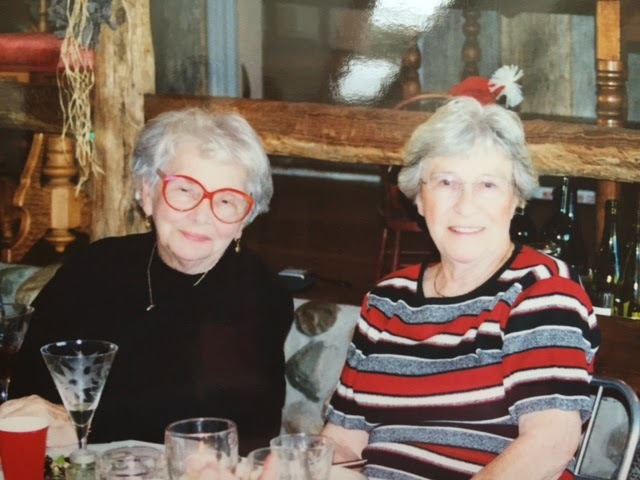 My grandma (left) and her sister, G.G. Mother’s Day. When I think of today, many images race into my brain. Memories of growing up with my siblings; conversations with my mom; the first time I held Luke, and then, Liam. Mother’s Day fills me with joy. It also reminds me of the family members I have lost. I think of them and love seems to fill every part of me. My grandmothers, my great-aunt, and so many more. But when I hear anyone mention Mother’s Day each year, one specific conversation always comes to mind. In the spring of 2000, Chris and I were extremely blessed to move into my grandparents’ farmhouse. My dad and my uncle had grown up there. 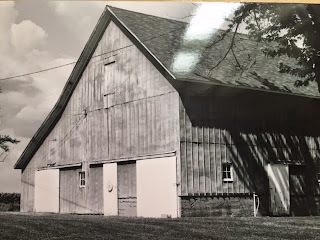 My granddad had passed away in 1990, and my grandma had elected to move a farm over to stay with her sister and brother-in-law for company. She had kept her home, went there most days, but really didn’t stay there at night. She had offered to us that we could live there, rent free, for a year so that we could save up money for a home of our own. We quickly agreed. 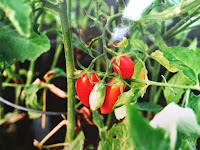 Moving to the farm I decided I needed to do what people living on farms do, grow something. I asked my grandma if she would mind if I had a small garden. She knew a guy, she said, and he’d till up a small spot for me. 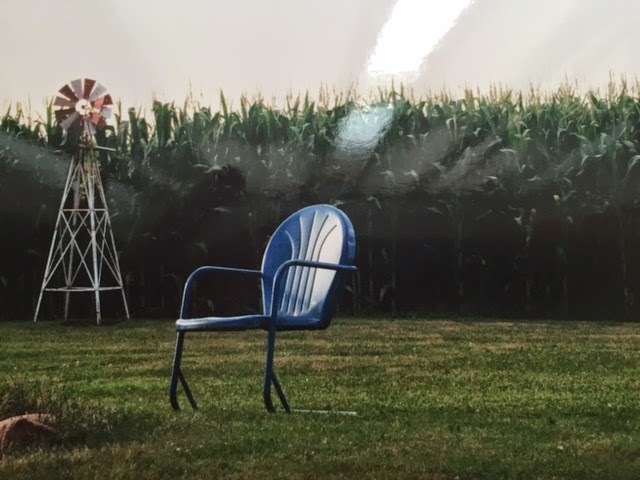 I still remember pulling in the drive to meet her, looking at the garage-size garden that she had created, and feeling more than a bit of trepidation of how I was going to possibly manage such a big space. 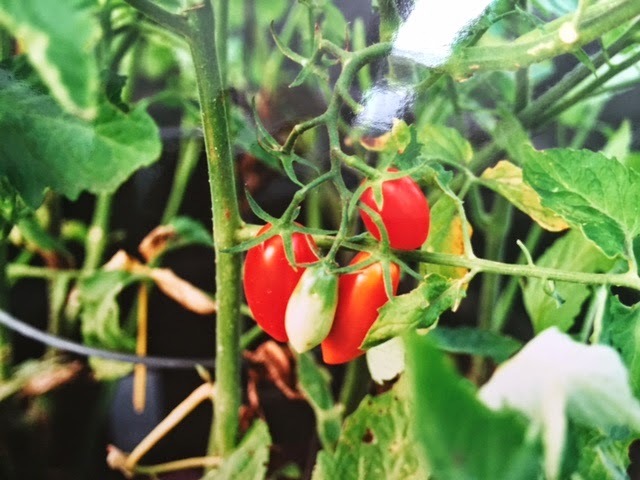 As she walked me around the garden, pointing out where the most sun would hit, she looked up at me, over the rim of her large red glasses, and said, “And you may not plant before Mother’s Day. People will always get in a hurry, rush to plant. There will always be a frost. Do not plant before Mother’s Day.” And that was that. Her proclamation, and I would follow it forever more. Each year I watch in April as the flowers come out at our grocery store, window boxes filling up, gardens beginning, but I cannot do anything. For it isn’t Mother’s Day yet. And while I lost my grandma some time ago, I would feel her standing over me shaking her head in dismay if I dared to put anything in the ground before today. I miss her so, but feel love around me every time I think of her. Happy Mother’s Day to you all. Planting season may begin. I gave an assignment to my fifth graders yesterday. If they could recommend any book to all of my new students next year, what would it be? We talked a lot about possible books and then, I shared my recommendation. I had been keeping a certain ARC I had in my possession a secret until then. I wanted to see what their reaction would be to my essay. Could I persuade them to read it? Oh boy, yes. The waiting list is a bit nuts. 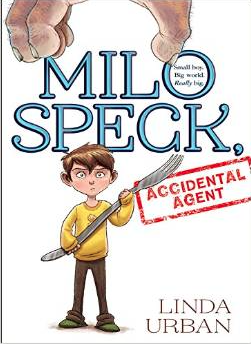 I recommended Linda Urban's forthcoming book, Milo Speck, Accidental Agent. Below I wanted to share my essay that I gave my students as a mentor text. I cannot wait to see what they will recommend to my new classes. I will bind these letters and put them in our library next year for new students to peruse and find recommendations. At the end of my essay you will see the requirements I gave my students yesterday in case you want to try something similar with your class. Have fun and look for Linda's book next fall. Have you ever read a book that just transported you to another place? If you have, you know what a magical experience that can be. I have recently read a book that fits this exact description and it is called Milo Speck, Accidental Agent. Milo is an amazing fantasy book written by the wonderful author, Linda Urban. There are so many reasons you should pick up this book, but today I’m going to focus on two – the author and the character of Milo. Linda Urban is a brilliant author. She has written books such as: Crooked Kind of Perfect, Hound Dog True, and Center of Everything. Her writing amazes me every single time. She does an amazing job of keeping her books short – without any extra words – but they are the exact words you need. In this book I was impressed at Ms. Urban’s desire to stretch herself as a writer. Her other books are all written in the realistic fiction genre and are pretty serious. In Milo she explores the genre of fantasy and the element of humor. Even in a new genre and attempting to make the book funny, Ms. Urban’s writing is still superb. In writing this new book, Ms. Urban has created the character of Milo. Milo is small for his age, his grandmother refers to him as “scrawny.” His dad travels for work and his grandmother watches over him. She is a bit grouchy. When Milo goes after a lost sock in their basement dryer, he is pulled through to a fantasy world named Ogregon. Unfortunately for Milo, Ogregon is inhabited by ogres. You would think a kid like Milo - a quiet, small, and timid kid – would freak out and become dinner the moment he was captured, but that is the beauty of this book. Through Milo we learn that all of us can be heroes. We learn that we can all be brave, in our own way. 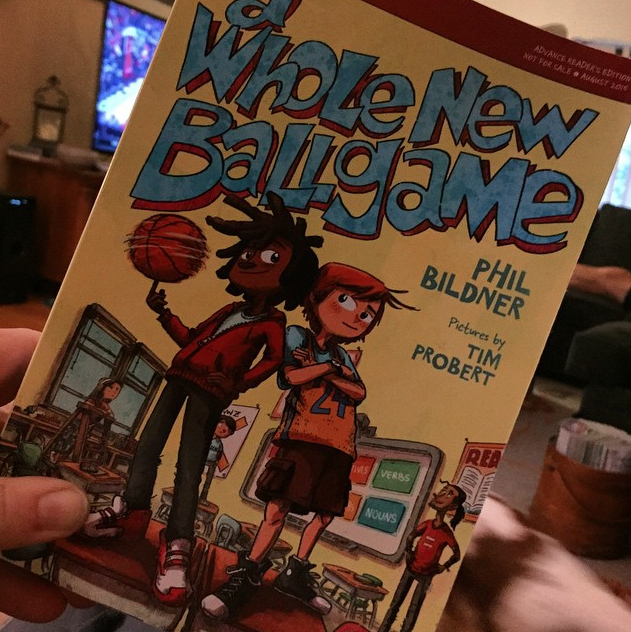 And along the way we learn with Milo a little bit about loyalty, friendship, and accomplishing the impossible. Through Milo, Ms. Urban teaches us a lot. I hope you will pick up this book when it comes out this fall. I was impressed with Ms. Urban for trying something new to her as an author and teaching me that even authors can be brave in their choices. Also, I loved “meeting” the character of Milo, cheering him on during his quest to get home, and learning a bit about myself through him. Books can make us better people if we let them. Milo Speck, Accidental Agent certainly does that. · Assigned on May 6th, due by the end of the day (1:10pm) on May 13th. · This is an essay, not a letter. o Do not write Dear Mrs. S or the like. o Do not sign it From, Susie. Your name should be at the top. 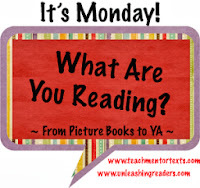 · Think of a book that every fifth grader should read. This is not necessarily your favorite book. For example, The Fault in Our Stars is a great book, but not appropriate for most fifth graders. · Your persuasive essay needs an introduction, at least two body paragraphs where you provide evidence for why someone should read this book, and a conclusion. · When looking at your body paragraphs, make sure they are on the same topic. For example, if one of my reasons is “character”, I wouldn’t talk about setting, format, and author in that paragraph as well. · This can be typed or handwritten. In both options, please pay attention to capitalization, spelling, and punctuation. In the handwritten option, make sure to use your best handwriting. · I should be able to hear your voice in your writing. Talk to the incoming fifth graders. Convince them to read your book. I cannot wait to read your writing.